We welcome guests for full overnight or multi-day packages. We're happy to adjust length of trip, number of nights and accommodate any food requests. We can also set it up to meet your time parameters or the ability of your riders. And we'll gladly offer discounts for large groups of riders. We've got the facilities and the equipment to accommodate your group of adventurous cyclists. Whether it's your first time out or you're a seasoned rider, we're sure you'll love what our trails have to offer you. 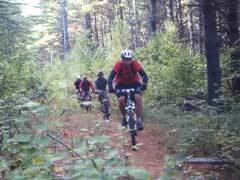 We honor mountain biking clubs and group discounts for four folks or more. So please mention to us if you're bringing a group or are a member of a riding club. Our rustic, all-wood-heated mountain lodge provides a large, inviting gathering space for everyone. The main living room is home to artsy objects, lots of overstuffed chairs and sofas, games, and lots of biking magazines. When weather permits, we eat out on our screened-in flagstone porch, and the wood-fired cedar hot tub on the back deck never seems to stay empty for very long. The private guest quarters in the main lodge have double beds and a shared bath. 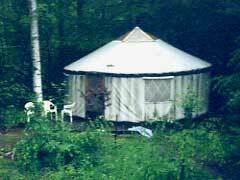 Our yurt is an airy, screened, bunkhouse which houses up to 10 adults comfortably. Our campsites are private and fully equipped with wash stations, showers, and toilet. • 2 nights accommodations, all facilities and amenities. Please plan to bring your own firewood. 1st Day: $50 per person, $40 Per person for 3 or more. Additional overnights + day of riding are only $30 per person. First day includes a guided orientation but if you feel confident about our trails you could do rest of your rides on your own or we'll gladly lead more rides. Additional days of guided riding is $10 per person per day.